Gare du Nord — Open 6:15 AM to 11:15 PM, 7 days a week. Located Level -1, below the North West Information booth, escalators down. Station for suburban and grand line trains (including Eurostar, TGV & Thalys), RER B, RER D, RER E and Metro line 2,4,5. Gare de Lyon — Open 6:15 AM to 10:00 PM, closed Sundays. Located in Hall 3 under train lane “N”. Station for suburban and grand line trains (including Artesia and TGV), RER A, RER D and Metro line 1 and 14. Connection to CDG airport via Air France shuttle. Gare Saint-Lazare has no storage lockers inside the station. Closest baggage storage facility is at Annexx Lockers located at 6 rue Constantinople, a 4-minute walk from Gare Saint-Lazare. Annexx is open 6 AM to 10:00 PM, 7-days a week. 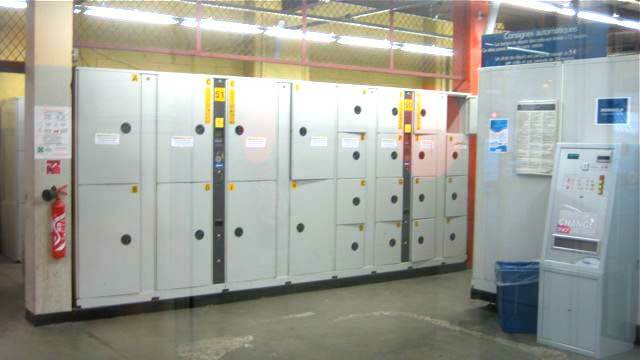 Lockers are 12€ per 24 hours. Locker can fit at maximum a suitcase of dimensions 81x55x34cm / 31.8″ x 21.7″x 13.4″ (a very large suitcase). More information at Annexx website. Gare d’Austerlitz — Open 7:00 AM to 11:30 PM, 7 days a week. Station for suburban and grand line trains (including Elipsos, Aqualys, TER, and Téoz), RER C, Metro line 5, and terminus for Metro line 10. Gare de l’Est — Open 6:00 AM to 11:45 PM, 7 days a week. Located Level -1 (Metro level). Station for suburban and grand line trains (including Lyria, City Night Line and TGV), Metro line 4, 5, and 7. Montparnasse — Open 7:00 AM to 11:00 PM, 7 days a week. Station for suburban and TGV trains, Metro line 4, 6, 12 and 13. Connection to CDG or ORY airport via Air France shuttle. Marne la Vallée Chessy (Disneyland Paris station) — Open 7:00 AM to 10:00 PM, 7 days a week. Station for RER A, TGV, Eurostar. Disneyland Paris also has its own baggage storage within the park, open 8 AM till 45 min. after close of Disneyland Paris. Airport Charles De Gaulle Terminals 1 & 2 — Storage provided by Bagages du Monde. See their page on the official Aéroport de Paris website for prices. Note: There is NO luggage storage at Gare Saint Lazare, although it is a main train station and does have a Lost and Found office. 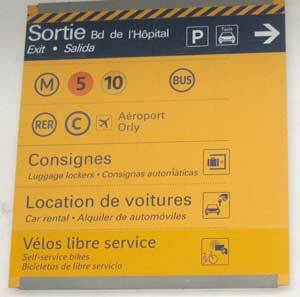 Same with Gare de Bercy: no baggage storage on-site although Gare de Lyon is within 15 minutes walking. Prices are 5,50€, 7,50€ and 9,50€ for small / medium / large lockers for the first 24 hour period and 5€ for each 24 hours after, depending on size of luggage locker (with a maximum storage time of 72 hours). If you use the luggage locker for more than 24 hours, you will be charged 5€ for each additional 24 hour period upon your return in order to retrieve your baggage. For example luggage storage lockers used for 25-47 hours would be charged an additional 5€ fee to open the locker storing your bags, 48-72 hours would be charged an extra 10€). Payment is by coins, chip enabled credit cards or debit card. Exception: Charles De Gaulle Airport has different rates which can be found here as this service is provided by a third party company, Bagages du Monde. 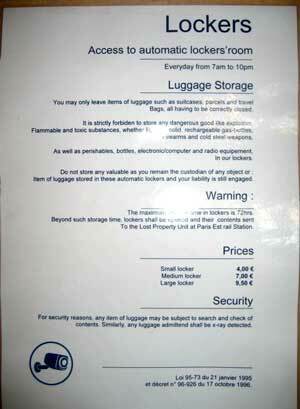 More extensive ParisByTrain article: CDG Luggage Storage. Paris train stations will have luggage storage services (known as consignes in French) ranging in different sizes and costs. 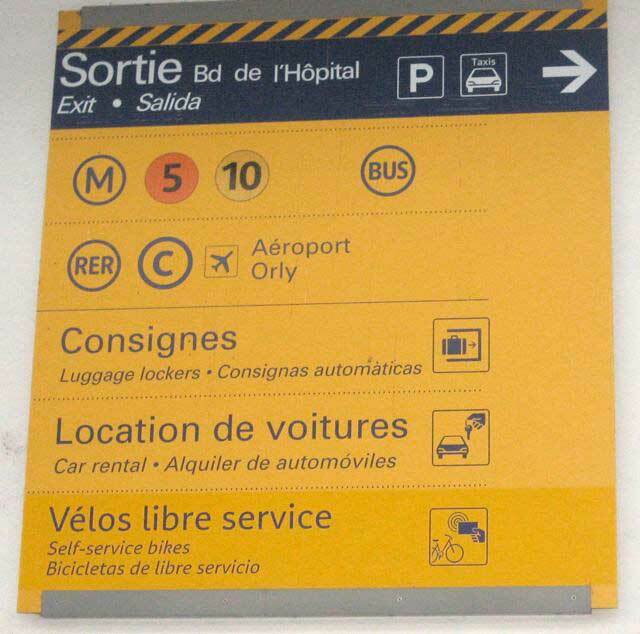 Most major train stations (Gare de Lyon, Gare du Nord, Montparnasse, Gare de l’Est, Gare d’Austerlitz) and airports (Charles de Gaulle- CDG / Orly) offer baggage storage options. 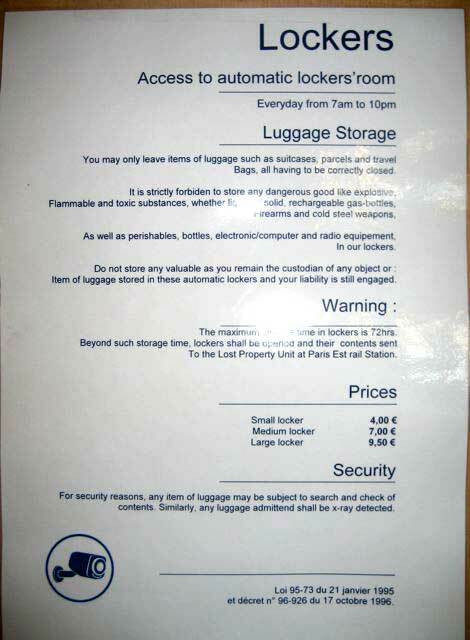 Luggage can be stored in the locker for up to 72 hours and are very useful when you have a layover in Paris. Knowing how to find and use the baggage storage services offered at Paris train stations can help ease your stay & travel in Paris and throughout France. Your luggage is only accessible when the stations are open and the luggage storage areas are open. Please see the opening hours above. Some stations have luggage carts. In order to use the consigne, all items will pass an airport style security machine. Electronic goods including laptops CANNOT be stored in the lockers.